The idea of “Happy Death Day” should have been a slam dunk. Taking inspiration from two excellent films, “Groundhog Day” and “Edge of Tomorrow” (also known as “Live, Die, Repeat”), this latest film takes both premises and adds plenty of scares and violence. What we end up with is an entertaining horror romp but also a film that, in the end, is just alright. It’s the birthday of sorority sister Tree Gelbman (Jessica Rothe, “La La Land”). Come night, she’s murdered, only to wake up to relive the exact same day all over again. Tree’s life becomes a psychotic rerun as she and her new friend, Carter Davis (Israel Broussard, “Fear the Walking Dead”), must find and stop the killer to break the loop and survive the night. There’s no doubt that “Happy Death Day” is an extraordinarily fun film. Jessica Rothe brings an undeniable amount of joy with each reset to the film as her character’s manic personality changes rapidly from day to day. Rothe is confident in every scene, demonstrating her understanding that the movie is a comedy at heart. The quirky direction of her performance keeps the comedy fresh. Just like Rothe, the screenplay is erratic, tonally confusing, and deliberately hilarious. There are some excellent, well-written jokes sprinkled evenly and abundantly throughout the film. It’s just a funny film in general. From its premise to the lines every actor charismatically delivers, “Happy Death Day” is a movie that is difficult to watch without cracking a smile. That being said, it would have been nice to see the movie really dive deeper into its own narrative. Tree only dies a handful of times, making it difficult to feel the frustration Rothe’s character so emphatically expresses. To see Tree die in a multitude of bizarre and violent ways over and over again would have made the pacing match the story, but it also would have aided sympathizing with the protagonist. 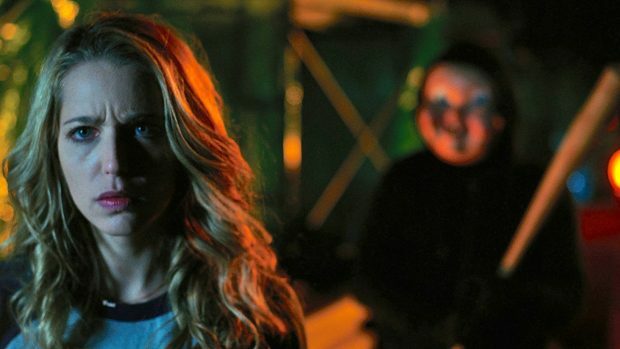 “Happy Death Day” is also marred by the fact that it’s self-aware enough to see how absurd its plot is, yet lacks the necessary consciousness to see its own tropes appear far too often. These clichés are rampant and unchecked. Tree’s character development, for example, is the usual “venomous sorority girl” turned kind and loving who falls for the geeky nice-guy. It’s been done thousands of times before, and frankly, it’s boring. When comparing the film to the obvious inspirations, “Happy Death Day” lacks the impact and emotional connection to the protagonist said predecessors proudly display. It also misses the mark on the incessant drudgery that would come from living the same day over and over again. On its own, it’s an enjoyable, inoffensive film that does what it sets out to do well — just not as well as it could have. It’s still hilarious and a blast to watch. If you enjoy horror comedies, “Happy Death Day” is a film you definitely should keep on your radar.